Albrechtsberger's String Trio in A Major, Op.9 No.2 is the second of a set of six which were published in 1795 Andre in Offenbach. However, not only from the early opus number but also and more importantly from the style, these trios most likely date from the late 1760s, just after the baroque trio sonata started to go out of fashion. While the first trio only had three movements, this trio consists of four movements and begins with an Allegro moderato. The second movement, marked Menuetto, poco vivace, would have been quite unusual for the time, given the tempo marking and certainly not a minuet which could be danced to. Next comes an Adagio and then the finale, which is marked Moderato and which begins in canonic form. 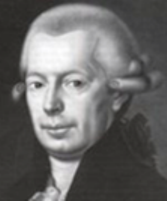 Johann Georg Albrechtsberger (1736-1809) was born in the Austrian town of Klosterneuburg not far from Vienna. He studied organ at the famous Melk Abbey. Through diligent work, he became perhaps the leading expert of counterpoint in his time and as a result became one of the most sought after teachers in Europe. Among his many students were Ludwig Beethoven, Johann Nepomuk Hummel, Ignaz Moscheles, Anton Reicha, Ferdinand Ries, Friedrich Kalkbrenner, Joseph Eybler and Franz Xaver Wolfgang Mozart. Besides teaching, he held several important posts as an organist, including to the Imperial Court in Vienna. Like most of his contemporaries, he was a prolific composer, writing numerous works for piano and organ as well as chamber music, including 28 known string trios. In addition, he wrote several influential theoretical works on harmony and counterpoint. Our new edition, complete with rehearsal numbers, follows that of the 1795 Andre edition. This is a valuable work, not only historically, but also because it comes from one of the most important teachers and theorists of the time.